In 1979, Southwark Council commissioned a town planning practice, Denyer Associates, to do an extensive study of Bermondsey Street. The work was part of a programme intended to reverse the industrial decline of parts of north Southwark. 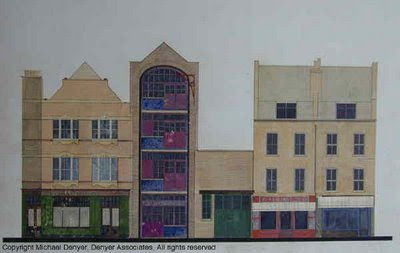 As part of that study, Denyer Associates created drawings of the street elevations. This drawing shows what was the Yorkshire Grey and No.103 Bermondsey Street as they were in 1979. At that time, the building to the right (south) of No.103 was a single storey warehouse.